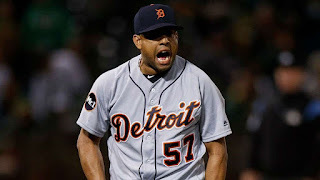 The Detroit Tigers announced earlier today that they have decided to cut ties with veteran reliever Francisco Rodriguez. Rodriguez saved 44 games for the Tigers in 2016, but has pitched very poorly this season. His 2-5 record and 7.82 ERA are atrociously bad and his 3.2 home run rate is nightmarish. Despite his struggles, he should earn another shot in the big leagues with a team that needs bullpen help. By now a vision of the Yankees’ bullpen, or a dumpster fire, (they are basically the same thing as of right now) should have instantly appeared in your head as a struggling bullpen that could use a new veteran arm. His name is Francisco Rodriguez. K-Rod has had an accomplished career with six All-Star appearances, three top-five Cy Young Award finishes, fourth all-time among all pitchers with 437 saves, and an MLB record 62 saves in 2008. While his dominant closer days are years behind him, he still has the potential to be a reliable middle reliever in any contender’s bullpen. Before his 2017 fallout, Rodriguez had only had one season with an ERA above 4.00 and had never pitched in less than 40 games. He has displayed durability and consistency throughout his career and is now out to prove he still has something left in the tank. Now before you tweet at us how ignorant this would be and ask why the Yankees would ever add a subpar reliever to a subpar bullpen, hear me out. Other than Clippard, the bullpen is extremely young and inexperienced. Clippard is the only reliever above thirty years-old and Chapman is the only reliever on the team with true playoff experience. Numbers aside Rodriguez could provide the Yankees bullpen with another voice and leadership in a relatively young clubhouse. His former manager Brad Ausmus was quoted recently saying that the reason they stuck with K-Rod for so long this season was due to his leadership and positive influence on the team. Rodriguez also has playoff experience and knows how to pitch on a contending team. The Detroit Tigers are known for having subpar bullpens year after year and signing relievers who don’t pan out. Joe Nathan, Mark Lowe, and now K-Rod fall into this category. A change of scenery and atmosphere could be the perfect revival for Rodriguez, who has experience pitching in New York with the Mets. Being surrounded by the likes of Betances and Chapman could relieve some stress and tension off of a guy who is so used to being the go to pitcher in every bullpen he has been a part of in his career. In an article I wrote earlier this season about the possible pursuit of former Ranger Sam Dyson, I mentioned how a change of environment could be huge into turning around a pitcher’s season. While it is an extremely small sample size, Dyson has more than halved his ERA in the National League West and is receiving praise from pitching coach Dave Righetti and others. K-Rod could very well follow suit in this path. When taking a look at Rodriguez’s splits, one number pops out immediately, which is his BAA for right-handed hitters. Rodriguez could be a victim of bullpen misuse as he allows hitters to only hit at a .245 clip from the right side compared to .340 against lefties. One would think the Tigers would then be inclined to pitch him in more of a right-handed specialist role to regain his confidence and stride on the mound. They failed to do this as, at the time of his release, he faced left-handed hitters more often than right handed hitters and was pummeled. Another interesting split his is BAA, when he gets behind in the count. When K-Rod starts a batter off with a one ball count, hitters are hitting a whopping .571 with six home runs against him. This displays K-Rod’s ineffectiveness of throwing quality strikes when he gets behind as opposed to just throwing a fastball down the middle just to get the count back even. Pitch selection is very often the scapegoat for a once successful pitcher With Rodriguez aging, his location and ability to throw the right pitch in the right count is vital to his success. While signing Francisco Rodriguez could ultimately backfire, the Yankees would only have to pay him the league minimum, and odds are he would not pitch worse than a certain Tyler Clippard has in the past few weeks. If he does fail, it would not be hard to let him go and try acquiring another arm by other means. However, if he is correctly utilized and makes appropriate adjustments, he could be an extremely cheap alternative to throwing away prospects for pitching help at the deadline.